Headshot of American athlete Jim Thorpe (circa 1920s). Jim Thorpe is remembered as one of the greatest athletes of all time and one of the most celebrated Native Americans in modern times. 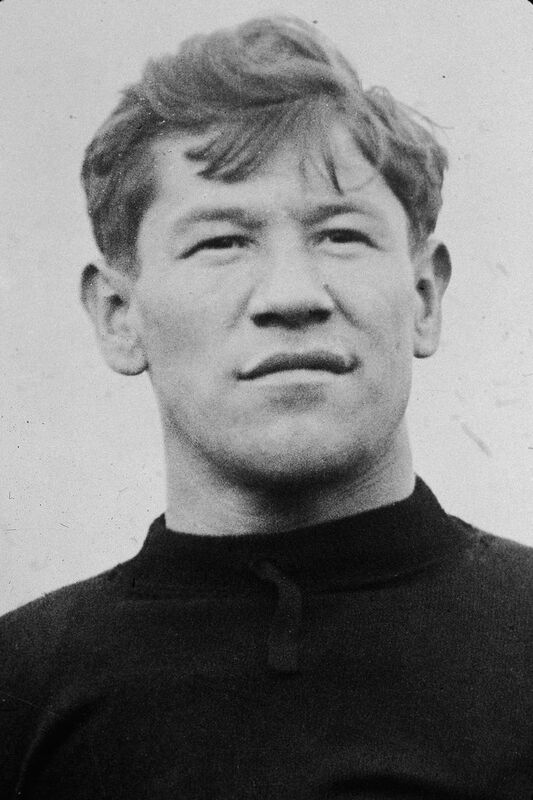 At the 1912 Olympics , Jim Thorpe accomplished the unprecedented feat of winning gold medals in both the pentathlon and the decathlon. However, Thorpe’s triumph was marred by scandal just months later when he was stripped of his medals due to a violation of his amateur status prior to the Olympics. Thorpe later played both professional baseball and football but was an especially gifted football player. In 1950, Associated Press sportswriters voted Jim Thorpe the greatest athlete of the half-century. Jim Thorpe and his twin brother Charlie were born on May 28, 1888 in Prague, Oklahoma to Hiram Thorpe and Charlotte Vieux. Both parents were of mixed Native American and European heritage. Hiram and Charlotte had a total of 11 children, six of whom died in early childhood. The Thorpes lived in a log farmhouse on the Sac and Fox reservation, where they grew crops and raised livestock. Although most members of their tribe wore traditional native clothing and spoke the Sac and Fox language, the Thorpes adopted many customs of white people. They wore “civilized” clothing and spoke English at home. (English was the only language Jim’s parents had in common.) Charlotte, who was part French and part Potawatomi Indian, insisted that her children be raised as Roman Catholics. The twins did everything together — fishing, hunting, wrestling, and horseback riding. At the age of six, Jim and Charlie were sent to the reservation school, a boarding school run by the federal government located 20 miles away. Following the prevailing attitude of the day — that whites were superior to Native Americans — students were taught to live in the manner of white people and forbidden to speak their native language. Although the twins were different in temperament (Charlie was studious, whereas Jim preferred sports), they were very close. Sadly, when the boys were eight, an epidemic swept through their school and Charlie fell sick. Unable to recover, Charlie died in late 1896. Jim was devastated. He lost interest in school and sports and repeatedly ran away from school. Hiram sent Jim to Haskell Indian Junior College in 1898 in an effort to discourage him from running away. The government-run school, located 300 miles away in Lawrence, Kansas, operated on a military system, with students wearing uniforms and following a strict set of regulations. Although he chafed at the idea of being told what to do, Thorpe made an attempt to fit in at Haskell. After watching the varsity football team at Haskell, Thorpe was inspired to organize football games with other boys at the school. Thorpe’s adherence to his father’s wishes didn’t last. In summer of 1901, Thorpe heard that his father had been seriously hurt in a hunting accident and, in a hurry to get home, left Haskell without permission. At first, Thorpe hopped on a train, but it was unfortunately headed in the wrong direction. After getting off the train, he walked most of the way home, hitching rides occasionally. After his two-week trek, Thorpe arrived home only to discover that his father was greatly recovered yet very angry about what his son had done. Despite his father’s fury, Thorpe chose to stay on his father’s farm and help out instead of returning to Haskell. Only a few months later, Thorpe’s mother died from blood poisoning following childbirth (the infant died as well). Thorpe and his entire family were devastated. After his mother’s death, tensions within the family grew. After an especially bad argument — followed by a beating from his father — Thorpe left home and headed to Texas. There, at the age of thirteen, Thorpe found work taming wild horses. He loved the work and managed to support himself for a year. Upon his return home, Thorpe discovered that he had earned his father’s respect. This time, Thorpe agreed to enroll in a nearby public school, where he participated in baseball and track and field. With seemingly little effort, Thorpe excelled at whatever sport he attempted. In 1904, a representative from the Carlisle Indian Industrial School in Pennsylvania came to the Oklahoma Territory looking for candidates for the trade school. (Carlisle had been founded by an army officer in 1879 as a vocational boarding school for young Native Americans.) Thorpe’s father convinced Jim to enroll at Carlisle, knowing there were few opportunities available for him in Oklahoma. Thorpe entered the Carlisle School in June 1904 at the age of sixteen. He had hoped to become an electrician, but because Carlisle didn’t offer that course of study, Thorpe opted to become a tailor. Not long after he’d begun his studies, Thorpe received staggering news. His father had died of blood poisoning, the same illness that had taken his mother’s life. Thorpe coped with his loss by immersing himself in the Carlisle tradition known as “outing,” in which students were sent to live with (and work for) white families in order to learn white customs. Thorpe went on three such ventures, spending several months at a time working at jobs such as gardener and farm worker. Thorpe returned to school from his last outing in 1907, having grown taller and more muscular. He joined an intramural football team, where his impressive performance gained the attention of coaches in both football and track and field. Thorpe joined the varsity track team in 1907 and later the football team. Both sports were coached by football coaching legend Glenn “Pop” Warner. In track and field, Thorpe excelled in every event and often broke records at meets. Thorpe also led his small school to football victories over larger, more famous colleges, including Harvard and West Point. Among the opposing players, he met on the field was future president Dwight D. Eisenhower of West Point. In 1910, Thorpe decided to take a break from school and find a way to earn money. During two consecutive summers (1910 and 1911), Thorpe accepted an offer to play minor league baseball in North Carolina. It was a decision he would come to regret deeply. In the fall of 1911, Pop Warner convinced Jim to return to Carlisle. Thorpe had another stellar football season, earning recognition as a first team All-American halfback. In the spring of 1912, Thorpe re-joined the track and field team with a new goal in mind: he would begin training for a spot on the U.S. Olympic team in track and field. Pop Warner believed that Thorpe’s all-around skills would make him an ideal candidate for the decathlon — a grueling competition comprising ten events. Thorpe qualified for both the pentathlon and decathlon for the American team. The 24-year-old set sail for Stockholm, Sweden in June 1912. At the Olympics, Thorpe’s performance surpassed all expectations. He dominated in both the pentathlon and decathlon, winning gold medals in both events. (He remains the only athlete in history to have done so.) His record-breaking scores handily beat all of his rivals and would remain unbroken for three decades. Upon his return to the United States, Thorpe was hailed as a hero and honored with a ticker-tape parade in New York City. At Pop Warner’s urging, Thorpe returned to Carlisle for the 1912 football season, during which he helped his team achieve 12 wins and only one loss. Thorpe began his last semester at Carlisle in January 1913. He looked forward to a bright future with his fiancée Iva Miller, a fellow student at Carlisle. In late January of that year, a newspaper article surfaced in Worcester, Massachusetts claiming that Thorpe had earned money playing professional baseball and therefore could not be considered an amateur athlete. Because only amateur athletes could participate in the Olympics at that time, the International Olympic Committee stripped Thorpe of his medals and his records were erased from the books. Thorpe readily admitted that he had played in the minor leagues and had been paid a small salary. He also admitted ignorance of the fact that playing baseball would make him ineligible to compete in track and field events at the Olympics. Thorpe later learned that many college athletes played on professional teams during the summer, but they played under assumed names in order to maintain their amateur status in school. A mere ten days after losing his Olympic medals, Thorpe turned professional for good, withdrawing from Carlisle and signing a contract to play major league baseball with the New York Giants. Baseball wasn’t Thorpe’s strongest sport, but the Giants knew that his name would sell tickets. After spending some time in the minors improving his skills, Thorpe started the 1914 season with the Giants. Thorpe and Iva Miller married in October 1913. They had their first child, James Jr., in 1915, followed by three daughters over the eight years of their marriage. The Thorpes suffered the loss of James, Jr. to polio in 1918. Thorpe spent three years with the Giants, then played for the Cincinnati Reds and later the Boston Braves. His major league career ended in 1919 in Boston; he played minor-league baseball for another nine years, retiring from the game in 1928 at the age of forty. During his time as a baseball player, Thorpe also played professional football beginning in 1915. Thorpe played halfback for the Canton Bulldogs for six years, leading them to many major victories. A multi-talented player, Thorpe was proficient at running, passing, tackling, and even kicking. Thorpe’s punts averaged an incredible 60 yards. Thorpe later played for the Oorang Indians (an all-Native American team) and The Rock Island Independents. By 1925, the 37-year-old’s athletic skills had begun to decline. Thorpe announced his retirement from pro football in 1925, although he did play occasionally for various teams over the next four years. Divorced from Iva Miller since 1923, Thorpe married Freeda Kirkpatrick in October 1925. During their 16-year marriage, they had four sons together. Thorpe and Freeda divorced in 1941. Thorpe struggled to stay employed after leaving professional sports. He moved from state to state, working as a painter, a security guard, and a ditch digger. Thorpe tried out for some movie roles but was awarded only a few cameos, mainly playing Indian chiefs. Thorpe lived in Los Angeles when the 1932 Olympics came to the city but did not have enough money to buy a ticket to the summer games. When the press reported Thorpe’s predicament, Vice President Charles Curtis, himself of Native American descent, invited Thorpe to sit with him. When Thorpe’s presence was announced to the crowd during the games, they honored him with a standing ovation. As public interest in the former Olympian grew, Thorpe began to receive offers for speaking engagements. He earned little money for his appearances but enjoyed giving inspiring speeches to young people. The speaking tour, however, kept Thorpe away from his family for long periods of time. In 1937, Thorpe returned to Oklahoma to promote the rights of Native Americans. He joined a movement to abolish the Bureau of Indian Affairs (BIA), the government entity that oversaw all aspects of life on reservations. The Wheeler Bill, which would allow native peoples to manage their own affairs, failed to pass in the legislature. During World War II, Thorpe worked as a security guard at a Ford auto plant. He suffered a heart attack in 1943 only a year after taking the job, prompting him to resign. In June 1945, Thorpe married Patricia Askew. Soon after the wedding, 57-year-old Jim Thorpe enlisted in the merchant marines and was assigned to a ship that carried ammunition to Allied forces. After the war, Thorpe worked for the Chicago Park District’s recreation department, promoting fitness and teaching track skills to young people. The Hollywood film, Jim Thorpe, All-American (1951), starred Burt Lancaster and told Thorpe’s story. Thorpe served as technical advisor for the film, although he made no money from the film itself. In 1950, Thorpe was voted by Associated Press sportswriters as the greatest football player of the half-century. Just months later, he was honored as the best male athlete of the half-century. His competition for the title included sports legends such as Babe Ruth , Jack Dempsey, and Jesse Owens . Later that same year he was inducted into the Professional Football Hall of Fame . In September 1952, Thorpe suffered a second, more serious heart attack. He recovered, but the following year suffered a third, fatal heart attack on March 28, 1953 at the age of 64. Thorpe is buried in a mausoleum in Jim Thorpe, Pennsylvania, a town that agreed to change its name in order to win the privilege of housing Thorpe’s memorial. Three decades after Thorpe’s death, the International Olympic Committee reversed its decision and issued duplicate medals to Jim Thorpe’s children in 1983. Thorpe’s achievements have been re-entered into Olympic record books and he is now widely acknowledged as one of the greatest athletes of all time. * Thorpe’s baptismal certificate lists his birth date as May 22, 1887, but most sources list it as May 28, 1888.
Who Was Bartolome de Las Casas? How did Jesse Owens achieve greatness at the 1936 Olympics?